2 books about north county St Louis. Includes tax. Ships in 4-8 days. All books signed by Author Craig Kaintz. More high school memories, recipes; featuring Florissant and Ferguson. growing up in a St. Louis suburb. 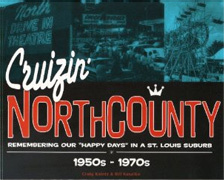 Producer Patrick Murphy takes a nostalgic look at North St. Louis County during the 1950s – 1970s era with the authors of the book Cruizin North County, Bill Kasalko and Craig Kaintz. They visit the sites of old landmarks—some still around, some long gone—and stop in at Chuck-A-Burger, a popular joint for teens to take their cars to hang out while cruizin. 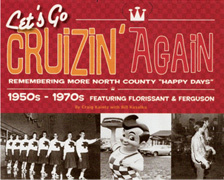 In their 2011 book, “Let’s Go Cruizin’ Again: Remembering More North County ‘Happy Days,’” authors Craig Kaintz and Bill Kasalko revisit the neighborhoods of their youth. 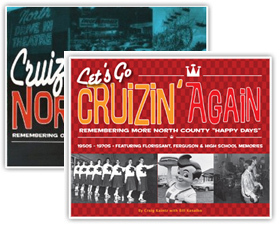 This follow-up book to their 2008 ‘Cruizin North County’ focuses on Ferguson and Florissant. They take us back with photos and memories of high schools, restaurants, drive-ins, popular hang-outs and more.